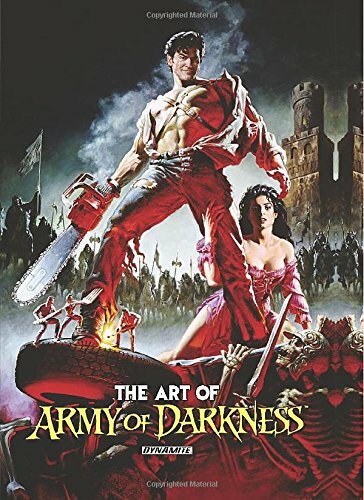 The Art of Army of Darkness is a book that's sure to delight fans of the film and comics. Dynamite Entertainment has released several artbooks over the years and this is yet another gem. The book's a large format hardcover with a beautiful cover of Ash with his cheeky grin and chainsaw. That cover is also the theatrical release poster for the film. By the way, some places have listed the book with the wrong number of pages. There are 256 pages. It's quite a thick book. Collected within are the wonderful cover artwork and full page illustrations drawn by numerous comic artists, namely J. Scott Campbell, Arthur Suydam, Nick Bradshaw, John Bolton, Ben Templesmith, Tim Seeley, George Perez and many more. It's really cool to see these artists bring their own drawing style to reinterpret the comics. The artworks are amazing and the huge reproduction, stretching to the edge of the pages, really shows off the details. Xena vs Army of Darkness: Why Not? Xena vs Army of Darkness: What... Again?! This is a terrific compilation. Highly recommended to the fans.